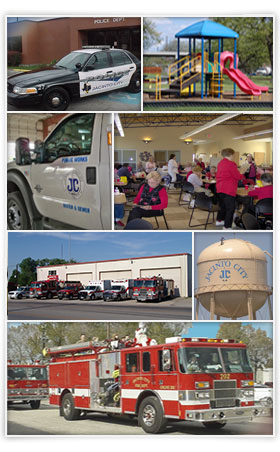 In addition to Fire Suppression, the Jacinto City Fire Department provides state of the art Emergency Medical Services to our residents. Our EMS units are certified at the BLS/MICU level of care and utilize the latest advancements in prehospital care. Our paramedics are able to provide high quality emergency health care expected in large metro areas with the personal attention only found in small cities. Our guiding principle is that we treat all of our patients like we would our family members. We realize that we generally meet our patients in times of great distress and pain so we do everything within our power to lessen the anxiety & pain for our patients and their families. For EMS Reports, fax a request and signed affidavit to: 713-820-9264. For EMS bills, contact Specialized Billing Inc. at 800-999-2417.